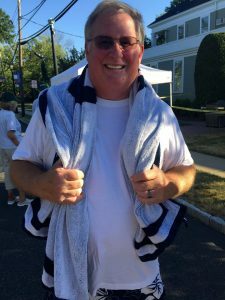 NEW PROVIDENCE, NJ – Residents, organizations, elected officials and emergency personnel came together on Tuesday night for New Providence’s second annual National Night Out in Centennial Park. National Night Out highlights emergency services and their relationship with the community and enables the community to stand together and promote awareness, safety and neighborhood unity. Police officers, firefighters and emergency medical technicians had their equipment on display and interacted with the community. A bounce house, dunk tank and other activities were available for children to enjoy. Food and beverages from the Prestige Diner and Zita’s were provided by the New Providence Business and Professional Association and New Providence Lions Club. Entertainment was supplied by Al Elefante. Lantern Hill Residences, Affinity Credit Union, and the Municipal Alliance provided support for the event.